Calling every Aviationtag a work of art would be going too far. But we can safely say that every tag is one of a kind. Why? That’s the question we are aiming to answer in today’s blog post. On the one hand, the products we sell are brand new, at the same time though you have to remember that they are made only from the original outer skin of what were once commercial aircraft. Some would call it “upcycling”, others would call it capturing living aircraft and airline history. The planes we use were all in operation for well over 10 years, flew several hundred thousand miles battling wind and weather at altitudes of 10,000 m. Some even spent several years in the blistering sun of their aircraft graveyard in the Mojave Desert, inevitably leading to changes in colouration and variations in the texture of the aircraft’s paint. Imagine your car would have run a million of miles – would it still look new? Of course not. And that is also why our tags often times have scratches – but those scratches are not caused by us but by the many flight hours the plane had. With most planes, aircraft skin currently consists mainly of an aluminium-copper-magnesium alloy. This is light but stable. The trend is now moving increasingly towards using composite materials (GRP, CRP) though. Depending on the aircraft and what section we get the skin from, the thickness can also vary greatly. Usually, the skin is thicker on the bottom of the aircraft and between the wings than it is on the top, where the load is also lighter, for example. 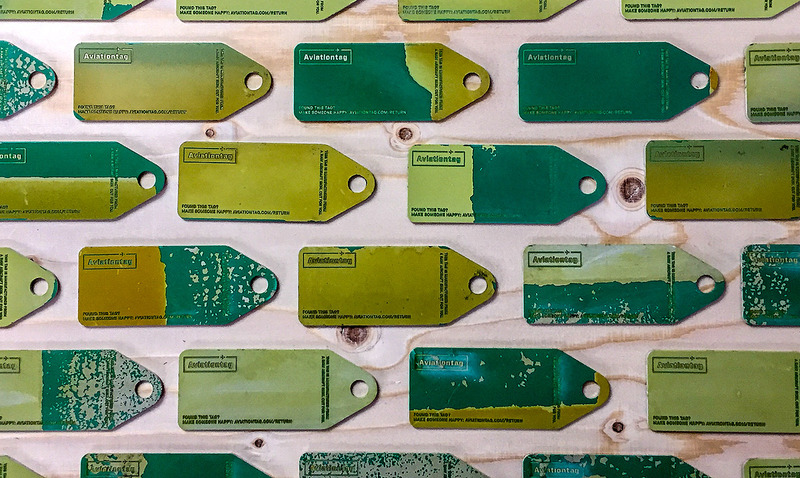 So in a nutshell we can say that although the tags vary in colour, thickness and surface texture, they all have one thing in common – they are all one of a kind. Did you like this post? Let us know in the comment box below and share it with your friends. Posted in Aviationtag, Background and tagged aircraft, aviationtags, flughafen, planespotter. This is one of the things that makes having a collection of these so interesting. A less than reputable person could (fraudulently) get a brand new piece of sheet metal and try to pass it of as aircraft skin, but every single piece would be completely identical – however with Aviationtag people are getting the real deal and it shows! I enjoy how every single tag is one of a kind, even though it can be from the same aircraft. Aswell as the front, I too appreciate the back of my Aviationtags because that side can hold the biggest surprises and tells something of that area’s structure – if you know what to look for (I don’t!). This leads me to a question. I have seen images of the back of the white EI-ETK Aviationtags, and one had a ridge running through it (one end slightly thicker than the other). What would have caused that to be a feature do you know? I’m guessing the raised fuselage panels that strengthens the passenger windows could be something to do with this – but I’m no expert and could be entirely wrong! EI-ETK also proves that not all panels are green on the back – this being a pale grey instead. That picture of the green side of the pieces of SE-DOR is beautiful, and I at least consider it to be a work of art!😘👍 So many different shades of green, and each one with it’s own unique pattern – mine included! I look forward to every single Aviationtag I order because you just never quite know what you are going to get – on the front or back (making it exciting!). I don’t know what would be more preferable – getting to select my own unique piece, or you guys as always choosing for me (which I love so much)! Thanks, Mark – much appreciated! An Aviationtag can indeed by thicker on one side than on the other – depending on how the material has been cut. Isn’t it fascinating how thin the aircraft skin is in certain areas of the plane? When you see a silver line, that is often times where glue was used on top of the rivets. Sometimes, you will also see purple on the back of the tags. Many thanks for your reply – that was most informative and appreciated Tobias!